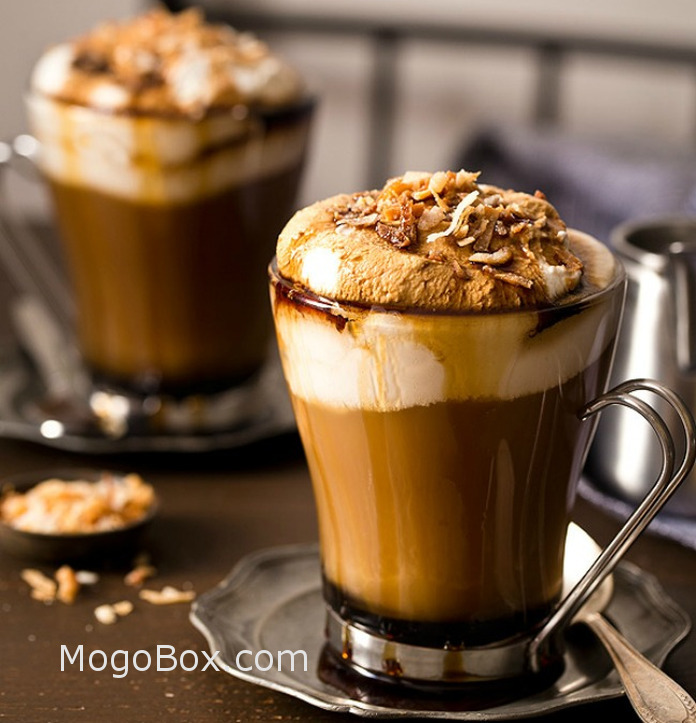 MogoBlog MogoLicious Tasty Tip of the Day: Topped with homemade whipped cream, coconut mochas make a great afternoon pick me up. In the bottom of one coffee mug stir together 2 tablespoons chocolate syrup and 1/2 coconut extract. Pour in 1 cup hot coffee and stir until dissolved. Stir in 1/4 cup milk. Repeat with a second coffee mug. Top both with whipped cream and toasted coconut. In a large mixing bowl (with whisk attachment if using a stand mixer), beat the heavy cream until thickened. Gradually beat in the sugar and vanilla then continue beating until stiff peaks form (when you pull the beater up, peaks will form and not fall over). This entry was posted in MogoBlog, MogoLicious and tagged #MogoBlog, Chocolate Syrup, Coconut, Coconut Extract, Coconut Milk, Coffee, Mocha, MogoLicious, Powdered Sugar, Vanilla Extract, Whipping Cream.